Flarble is the world's smallest flying toy. Our first encounter with Astonished Man Design was in June of 2011 when we asked him to do a logo re-design for our toy, the Flarble. 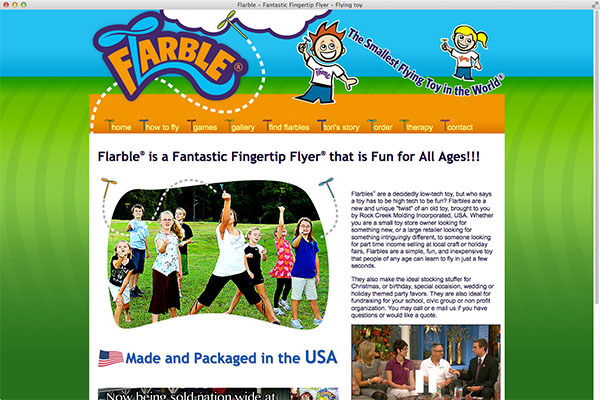 We were very happy with Keith's design and subsequently decided to have him build us a website for our toy also. We were very pleased with Keith's work on our website and any revisions or changes we had wanted, Keith was always very quick to respond, and we were always more than satisfied with the end result. Over the past few years, we have had Keith build us another website for a different facet of our business, several graphic components such as signs and flyers, additions and revisions to our packaging, and he also helped us source some of our packaging components. Astonished Man is also very reasonable with maintenance and hosting fees.